UPDATE: FOR THE COCONUT MILK, I USED COCONUT MILK FROM A CARTON. IT’S UNSWEETENED AND 50 – 60 CALORIES A CUP. I PURCHASED MINE AT TRADER JOE’S BUT I DO KNOW THAT THEIR ARE OTHER NAME BRANDS, SUCH AS SILK AND COCONUT FLAVORED ALMOND MILK. I was originally going to post this recipe on Monday, but I couldn’t wait and wanted to post it today!! I figured I’d beat Starbucks to the punch since they already sent me a coming soon e-mail and when I saw the photo I knew I just had to share mine first!! Yah, yah, you know what I made here! This my friends is my Pumpkin Spice Frappe! It’s creamy, smooth and tastes just like pumpkin pie! I gave Little Jenny a sampling and she said “Oh my Gosh”, this tastes just like Starbucks! Yes it does my Friends!! But I know what your thinking, there’s coffee in it! Well of course there is, but I thought of you non-coffee drinkers too and made, you ready? 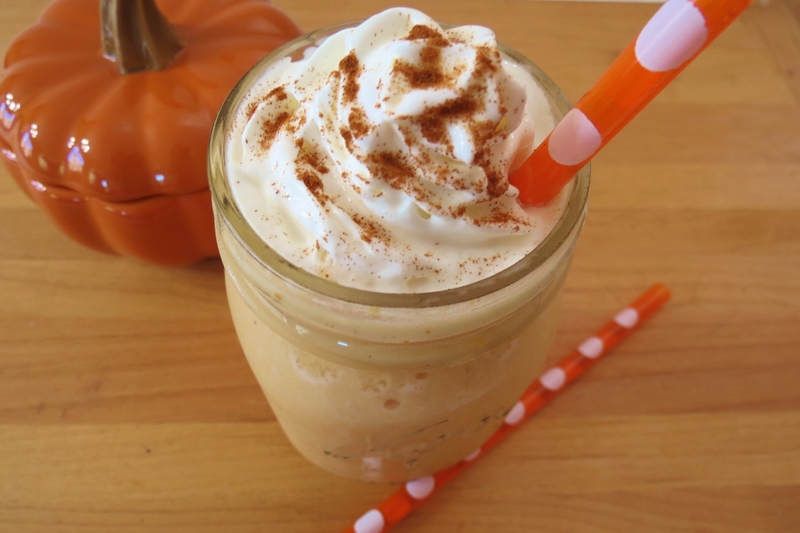 A Pumpkin and Cream Frappe just for you! Your getting two versions of the same drink, one with coffee and one without!! I of course had both versions and I can’t decide which one I like better? The non-coffee one is made with coconut milk and oh my gosh this one really tastes like pumpkin pie. This is not an almost tastes like pie, it does tastes just like pie!!! I just love this drink and I mean love it! 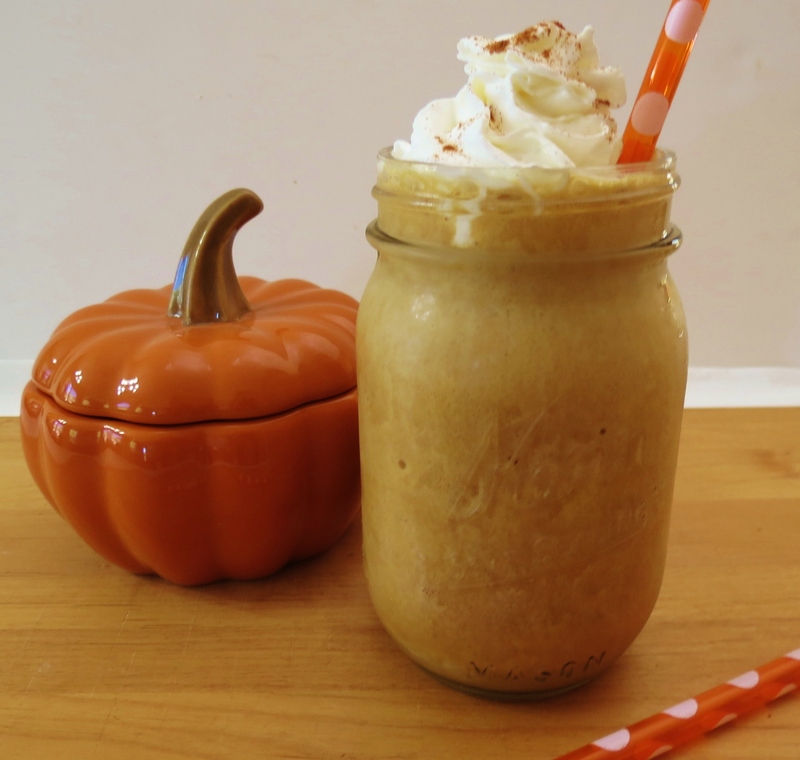 It’s so guilt-free, it’s crazy and so when I want pumpkin pie, I am so making this drink!! It’s truly amazing!! The coffee version tastes just as amazing!! It has just a hint of coffee, but tastes mostly like pie. It’s kind of like having a piece of pumpkin pie with your coffee! Mmmm, so good!! Both these drinks are made very similar. I used unsweetened coconut milk, canned pumpkin, pumpkin spice and a pinch of vanilla. I wasn’t sure about putting canned pumpkin in a coffee drink, it sounds weird, but it works out so well. Dam, I am pleased with this drink!! When I posted my Chocolate Raspberry Frappe this week, Joanne left a comment asking if I had a pumpkin frappe recipe and at that point I already did! My Husband is the one who told me to wait till Fall to post it, but really how can I wait? I get to excited and I just had to share with you!!! Crazy isn’t it? Look at the calories alone!!! he he, I get all giggly when I see such a big difference!! 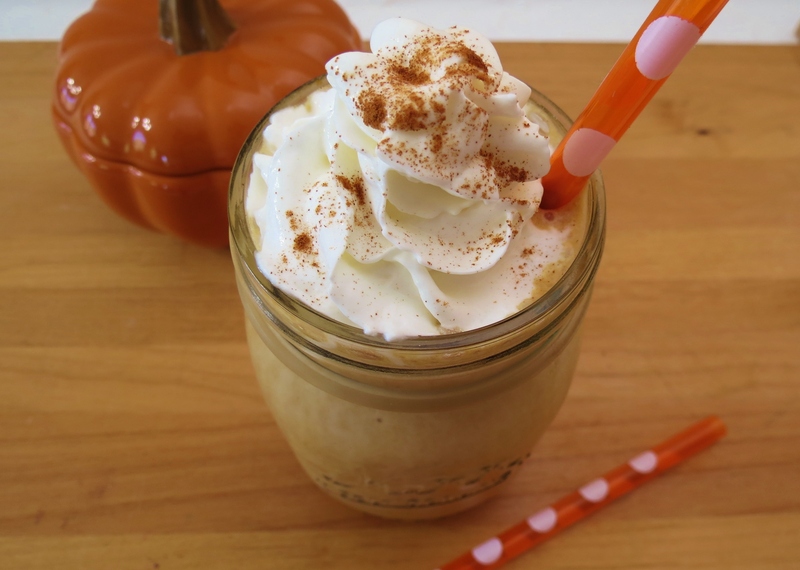 A frozen blended coffee drink that is creamy, sweet and tastes just like pumpkin pie. I can’t post two recipes when using Zip List, so I am typing the recipe out for the Pumpkin and Cream Frappe (non coffee version). But let’s do another comparison, shall we? Look at the carbs and sugar! This is craziness!! I’m telling you this drink is fantastic! It has healthy fat, low carb, low calories and is even vegan!! Have I sold you yet? I almost forgot to tell I did make this drink using non-fat milk and the flavor is ok, but not as good as using coconut milk! The coconut milk makes it very creamy and this kind of drink, you want creaminess!! I do have to let you know I am not ready for fall yet, since my summer seemed to short, but I can’t wait for pumpkin and apple season! I really love my fall fruits and veggies!!! Have a super fabulous weekend!!! Oh.My.Word!! Just found your site through a comment on Snack Girl and I am SO glad that I did! This drink looks AMAZING!! I can not wait to try it out! Thanks for sharing! U make this drink hot? Do you have a measurement for raw sugar instead of stevia? I have found that stevia is one of my migraine triggers. Your recipe sounds so yummy & I know it normally takes less stevia than sugar. Can’t wait to hear back!!! HI, I recommend starting. With 1 tablespoon and adding more sugar if u need it. Sometimes I use two packetts of stevia, sometimes I use one. Sweetness is a personal thing. Let me know how it turns out. Hi Jennifer, I dont know what happened but I made the Starbucks Pumpkin Frappe last night and it was….gross. It was an expensive mistake! I followed the directions exactly except for using Truvia instead of Stevia. I can only think it was the coconut milk. I used “Taste of Thai” canned unsweetened coconut milk ($3.19 a can!). The calories didn’t add up either. 1/2 cup of coconut milk alone was 140 calories and 11grams of Fat according to the can. What went wrong? It was bother, greasy tasting, and no flavor of pumpkin. I so want to make this work!! Oh no, thats horrible!!! I use coconut milk from the carton, it’s 50 – 60 calories a cup. I think the canned coconut milk is to heavy for this recipe. I am soooooooooo sorry!! I’m going to put an update onto this post!! Again, I’m so sorry, I feel just horrible!! Sorry you thought it was gross! Canned coconut is to greasy for this recipe. You have to use the unsweetened coconut milk in the carton. Sorry to disappoint you! You used the wrong ingredient, which is why it was gross. The recipe states to use coconut milk that is in liquid form – as in the drink. This type of coconut milk is a substitute for cows’ milk. The type you used is for Asian stir fry dishes. It is largely oil based and is totally inappropriate for drinking. Whenever a smoothie or milkshake recipe calls for “coconut milk,” they are talking about the drinkable type, not the type used for cooking. When executed properly, this recipe is very good. That type of coconut milk is for rich tasting meals, not this type of recipe. Try Silk coconut milk from the milk area of your supermarket. Or any other. I love both versions, for me coffee one in the morning and non-coffee in the evening for dessert! Can you use vanilla almond milk in the carton instead of coconut milk? Hi Jennifer, yes that would work out great too! Enjoy!! Wow! You read my mind, I was just thinking about trying to make a pumpkin spice latte! The mornings are feeling just a bit cooler and fall is right around the corner =) YUM! I noticed the mornings are chiller too and as soon as that happens this time of year my brain automatically goes into comfort mode which is pumpkins and apples! Oh..and thanks for bringing it to Foodie Friends Friday too! Got distracted by the pictures and forgot to say what I came for, lol! lol, your funny!! Thank you for having me!! Pinned twice! 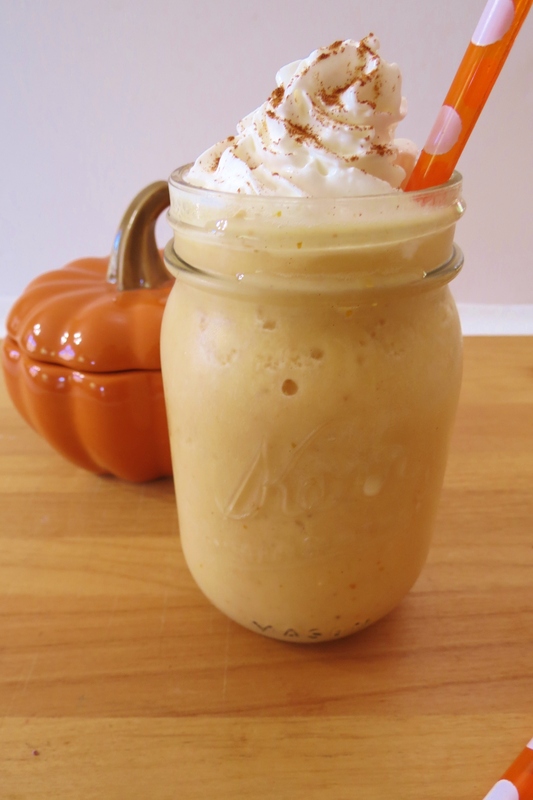 smoothies and pumpkin! Delicious. I want this baby right now! Wow, pumpkin and coffee-yes please. You are the coffee queen. Your drinks never fail to make me drool. lol, Thanks Laura! I love making these drinks, there so much fun!!! 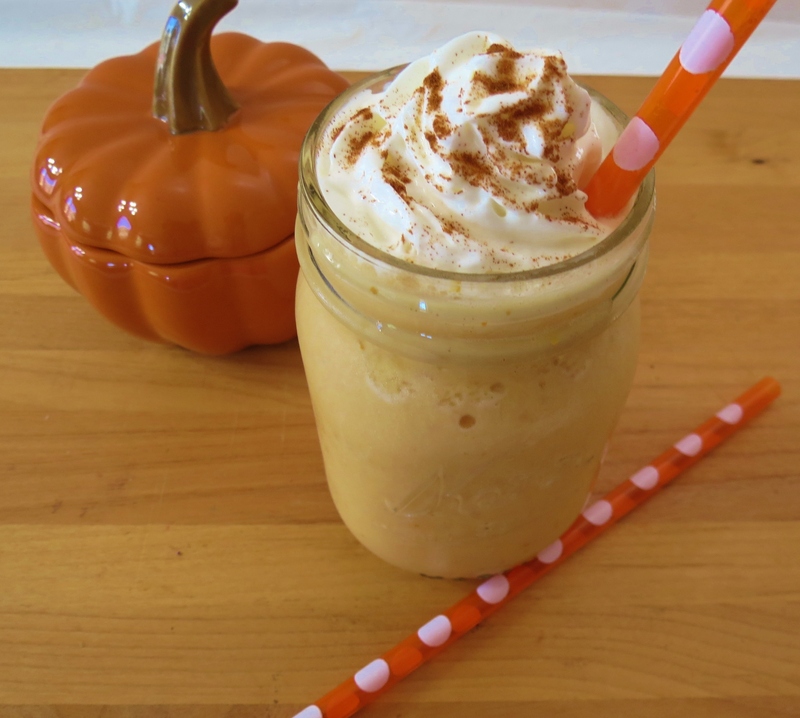 I need to get my hands on some more pumpkin so that I can make this drink this weekend! Me too! I only bought one can, not realizing that I want everything pumpkin right now!! That’s so funny! I made one myself earlier today! It’s getting to that time of year!! I just love pumpkin!! I need to stock up on pumpkin again! I’m in love with the non-coffee version of this! Me too!!! I am completely out! I have to get more today! I got the taste for pumpkin and I love it!! I love, love, love all your wonderful, low calorie coffee drinks! You are giving me a taste of Fall, can’t wait! Thanks Chris! I really do have fun creating them!!! This drink looks and sounds AMAZING! I love all things pumpkin. Just wondering what kind of coffee you used in terms of brand and flavoring? Thanks! I actually use Trader Joe’s Instant Coffee. I place 1 1/2 cups of water in a shallow plastic container add a heaping teaspoon of coffee, mix together and freeze. I normally don’t care for instant coffee, but they work great in frappes. Yum! Glad you did not wait until Monday with this post 🙂 Yet another delicious frappe, and yet another RecipeNewZ success and Facebook feature: http://www.facebook.com/RecipeNewZ 🙂 Congratulation and have a fabulous weekend! Thank you so much! I am honored!! Oh my gosh your dangerous!! I’ll see what I can come up with, but to have a pure creamy, sweet chocolaty drink maybe hard, but I’ll try!! OH.MY.GOODNESS! You are SUCH a woman after my heart. This awesome drink is calling…screaming!…my name. Printing right now. I will be enjoying it soon. Thanks SO much for sharing. I don’t have a Starbucks close by anyway and am always thrilled to make these treats for myself. Hugs to you!! LOVE your photos – those orange polka dotted straws are absolutely darling! Thanks for pinning! You don’t like pumpkin pie? Oh no! Try the drink and you may change your mind! I’ve never had the pumpkin frap at Starbucks, but I think I’ll skip that and just try yours instead! I love adding pumpkin pie spice to my coffee, so I can only imagine how good a frozen version is. BTW – your straws are so cute. I have to tell you that I think I love my version better and I love that it’s guilt-free!! If you do try it, stop back and let me know what you think! Have you tried making this in a hot version for winter or for those who love their morning hot coffee? Maybe warming ingredients in a sauce pan and adding to hot cup of Joe? You are my second request to do this! I’ll pick up some more pumpkin and give this a try! I’ll let you know how it goes!! I was just about to ask this question then you beat me to the punch! It’s cooler where I am now and I’m dying to try a hot version! hi! i saw this recipe on pinterest (of course!) and this sounds sooooo good. just a little question, though.. is there anything that could replace the need for stevia in the non coffee version should one not have any on hand? Hi Becky! I would add 1 tablespoon of sugar, taste and if it’s not sweet enough, add a little more. You could also use Truvia or Splenda in place of the Stevia. If you make it let me know what you think! Have a great day!! Honey or maple syrup would be a nice natural alternative, as well. what about a frozen banana, a true natural sweetener..
That would be perfect, it will just change a little in flavor!! I found you via Amee’s Fit and Fabulous Fridays and I love you. Seriously – I LOVE YOU. I cannot wait to make this! Lol your funny!! Enjoy the frappe and stop back and let me know what you think of it!!! For some reason I can’t leave my own reply but only reply on others…. I am so making this! I love pumpkin. thanks for sharing on Foodie Friends Friday. Any time! Thank you for letting me share!! I hope you like it! Stop back and let me know what you think of it! What brand of coconut milk did you use? Would almond milk work as good? Almond milk should work, but I”m not sure how the taste would be. I would say try it and see how it goes. I use Trader Joe’s unsweetened coconut milk. It’s 50 calories for 1 cup. Want to try this so I bought a can of coconut milk. But it says it has 120 calories and 11g of fat in 1/3 cup! It is pure coconut milk, nothing added. My other choice was Silk Vanilla coconut milk. Did I buy the wrong thing? Hi, I use unsweetened coconut milk in a carton. Its 60 calores a cup. I never boughtt sil vanilla but I bet that would taste good too. Hi Ginger! I used Trader Joe’s refrigerated unsweetened coconut milk, it’s 50 calories for 1 cup. They have two kinds, one in the refrigerator isle, and on not refrigerated. The one not refrigerated is in a carton and is 60 calories for one cup. I have used both and both are good. I am sure other brand sell it, you just have to look. What do you mean by 1 1/2 cups coffee, frozen, partially thawed. Do you brew coffee and than freeze it? Thanks for sharing! Oh, I freeze 1 1/2 cups of coffee and then I let it thaw out just a little so my blender can handle the blending!! How would you recommend storing this? Maybe if I wanted to make it beforehand and take it on a picnic…. Could you use a bit of coconut oil with milk instead of coconut milk? I probably wouldn’t use coconut oil. Coconut oil isn’t creamy, thats why I use the milk. I’m loving this recipe! The pumpkin spice latte drink at starbucks. I got a grande yesterday and it was $4.95, yikes! Anyway I need this drink in my life and this looks like a cheaper way to make that happen. I had a question though, I don’t like coconut at all, do you actually taste the coconut? Hi! No you don’t really taste the coconut, it just makes it creamier. I tried it with non-fat milk and it’s ok, but not as good as with coconut. I don’t think you’ll notice the coconut taste, I really didn’t and no one in my house commented about it. They said it tastes like pumpkin. Wow, $4.95 for a pumpkin spice frappe, thats just crazy!!! Try out my recipe and let me know what you think of it. Have a great weekend! Oh you must try it! This was the first time i ever added pumpkin in coffee and its amazing!!! Funny how you come up with crazy concoctions! Thanks Melinda! If you try it let me know what you think of it. Darn, all this coffee talk, makes me want one!! Thank you, thank you, thank you! Quit eating sugar (again) couple months ago. Love all the fall drinks and now I won’t have to miss out and I’ll save a fortune! Your welcome! I’m trying, key word trying to cut back on sugar. It’s so hard, but I can do it, I think!! I love these drinks, and I love making them at home! Beats the cost of the coffee shops. I’m trying to do some Christmas saving and not going to the coffee shop will save me a small fortune! Did I say Christmas? Way to early for that!! Never too early for Christmas! Definitely cheaper and healthier. I heard frappes are going for almost $5.00, crazy!! You could buy all the ingredients for that amount and get 6 or more drinks out of it!!! If you make it let me know what you think of it! 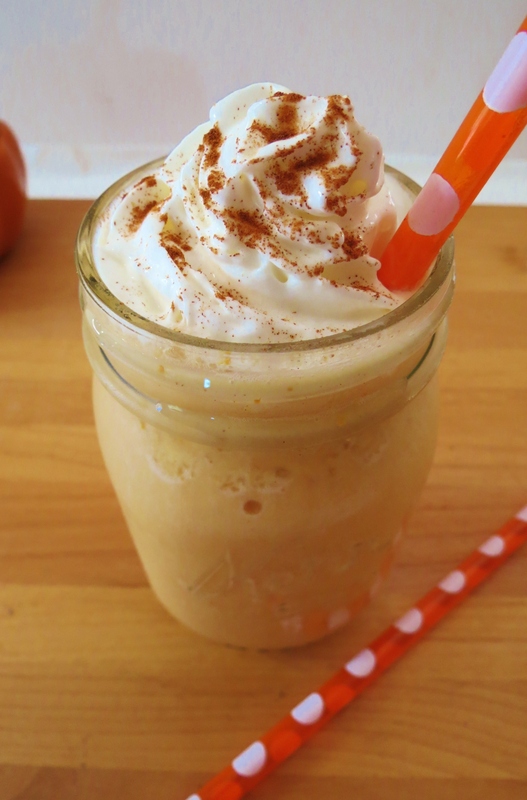 Hi, love your blog:) I found your Pumpkin Spice Frappe on Pinterest. I just finished drinking it. It was delicious, thanks for sharing it. OMG….I effing love you right now!! Just finished making my first one and I am in love with the cream version. Even my hubby approved! You are my hero! Oh my gosh you crack me up!!! I am so glad you like the drink!!! I was actually pretty impressed how well it turned out. Now you got me wanting to make one! Going to make i=one right now!!! Have a great night!!! This looks amazing and I really want to try it. I’ve never had the one at Starbucks but I love pumpkin pie. Would I be able to make this with regular milk instead of coconut milk? I tried it with non-fat milk, it was good, but not as creamy. I would give it a try and see what you think!! Let me know!! You should add some Visalus Shake mix to that smoothie! That’s what I’m going to do! It will add a great sweet cream flavor to it with a TON of nutrients, vitamins and protein! yes it will add some calories to it, but it would make it a meal! I never heard of Visalus Shake mix. Where do you get it? again.. i had no intentions to promote .. You can certainly delete my post if you feel you need to… I am just so excited about what its done for me… I got carried away i have a new smoothie! thanks!! AJ, how did it turn out? Did you make exactly as directed with a scoop of Visalus? I have some here and it is my favorite protein powder. I loved Arbonne and still do but the sugar in it is higher than I would like so I switched. Sorry it didn’t turn out for you. Sometimes it depends on the brands you use. I used Trader Joe’s unsweetned coconut milk. I don’t find it has a very strong coconut taste, but then again I love coconut. If you do try it again, add a little more pumpkin. Thank you for bookmarking my site, and I am truly sorry you didn’t care for the drink. I used the canned coconut milk and didn’t like it. I’m sure the stuff in the box is better. I tried it with almond milk and it was awesome. I tried it with skin milk too and it wasn’t super great. The coconut milk makes it really creamy. Hey, if you don’t want that left over pumpkin send it my way! he he Did you know you can also freeze your pumpkin. Just place in a ziplock freezer bag and pop in the the freezer. However, I doubt you’ll find ways to use it! Once the weather cools a bit I will start to make warm lattes. Since it’s been in the 80’s and 90’s I am still on a frappe kick. Is there a special recipe you would like me to post? I’d like the warm version recipe of this please. Found this via pintrest! Love pumpkin! Could you use yogurt instead of the coconut milk? Cannot wait to browse your other recipes! I never used it in this drink, but I have had yogurt mixed in with pumpkin and it tasted wonderful!! Just be sure to add sugar and pumpkin pie spice. Give it a try and let me know how it is!! OMG, I can hardly wait to try this. I have been drinking my own mixture as a breakfast, but you have opened up a whole new drink for me. I see a yogurt & pumpkin up above so am going to look for that recipe here. Also going to sign up for e-mails. I found your web site through Pinterest. Ohh, if you try it, let me know what you think of it. My family and I love it!! I’m so glad you found me, please stop back anytime. Oh. Wow. I am most definitely gonna do this!!! I low carb and love pumpkin and coffee and, and, ALL OF IT!!!!! Thanks so much for sharing!!!! Anytime, let me know what you think of it!! Have a great rest of the weekend!! I’m going to buy the stuff to make this today!!!! So excited! I’m on Weight Watchers and have really missed my frappes! And it’s only 1 WW+ point! How fantabulous! Oh you have to let me know what you think!! I Hope you like it!!! I love them and I love them more because I’m saving calories, sugar and carbs! I just made the Cream version- so delicious! However, there just wasn’t enough of a pumpkin taste for me so next time I’ll be using less coconut milk and more pumpkin. Thank you for an awesome recipe! ha ha You make me laugh! I am researching matcha tea right now and I think I’m going to order it tomorrow. I know what SB puts in there, not I just need to figure out how to do it so anybody can make it at home. So stay tuned for that recipe, I’m hoping to make it in the next few weeks. As for your pumpkin frappe, add more pumpkin. I found Libby’s pumpkin is pretty strong, but I just bought some organic pumpkin and I needed to add more pumpkin to my drink because it wasn’t pumpkiny enough for me. Whoo-hoo!!!!! THANKS!!!! Green Tea Frappe is my weakness during the rest of the year but it’s over an hour to the next Starbucks! I just made the cream one exactly how you instructed and its not creamy, it’s very thin and not so sweet. =[ thoughts? I had the same problem, the coconut milk I used was not cold. Should I freeze it? I would freeze it, at least freeze partially (about 4 hours). I use my frozen, but my Husband likes his with ice cubes. I had the same problem as well – not sweet or creamy enough. I did use regular 2% milk though and regular sugar. I was wonderin gthe same thing also! But eventually I ran to my kitchen and saw that my canned coconut milk said it was 140 calories for just a 1/3 cup! I was really suprised. She says earlier in the comments she buys hers in the refridgerated section at Trader Joes; it’s unsweetened and only 50 calories for a cup. Hi! I used Trader Joe’s unsweetened coconut milk. There’s one in the refrigerator section that is, like you said 50 calories a cup or there is one in the aisle with the almond and soy milks that is 60 calories a cup. I like them both. For stevia I like NuNutruals. It’s the only one that doesn’t leave an after taste in my mouth. I’m sorry, thank you for pointing that out to me. I will be more detailed in my recipes. I know different brands and similar products make the recipes turn out a bit different, so your right I will say what brand I use. Oh and on this drink I use the carton one, not the canned. Trader Joe’s carton either in the refrigerated section or in the aisle with all the soy and almond milks are located. It’s quite nippy here this morning so I am delighted to have found your recipe! I am going downstairs to try it right away. I will be using unsweetened almond milk, though. I tend to keep that on hand more readily than the coconut. I will let you know how it works! Wish I had some coffee already frozen. I could go for the coffee version 😉 Thanks! Almond milk does seem to be a reasonable substitute. I made it with warm coffee and, though not at all creamy, it is tasty. It has more the nature of a warm latte than a frappe, this way, but it is delicious! I will try the coffee-less version this afternoon! Oh good, glad almond milk works. Having it warm is so perfect for a chilly morning. OMG! This looks amazing. I am on a 1200 calorie diet and really miss having yummy treats! This is perfect. Thank you, thank you, thank you! Can’t wait to try this! Im on Atkin’s and starbucks are just way to high in carbs and sugar for me so it order for me to enjoy one it would have to be a cheat day lol. My Diet and bank account will thank you! I hope you like, please let me know!!! I usually don’t ever leave negative comments, but I really appreciate comments on recipe suggestions! I LOVE pumpkin drinks and I’ve already tried a few this week. Dairy, however, does not sit well with me so I tried the coconut version. It was not good!!! In my opinion there was too little pumpkin and spice and WAY WAY too much stevia. I used half that amount and had to dump my drink because it was soooo sweet it made me feel sick. I’m not sure if it was a typo? I wound up using a similar recipe, minus the banana, with more pumpkin, pie spice and maple syrup instead of stevia. That was delicious. Just a warning for anyone interested in trying this! I’m sorry you didn’t like the drink. My family and I like it, but not every recipe is for everybody. I normally add 1/2 tsp of Stevia in my drinks, but to me this one needed to be sweeter, but sweetness is a personal preference. The drink you made using maple syrup sounds wonderful. I saw that you use NuNaturals stevia. Do you use the powdered one or the liquid one? Hi Erin, I use the powdered one, just a packet of sugar. I was wondering if this drink can be made hot. For someone who lives in a chilly place and loves pumpkin, wondering if it’s possible?? I haven’t tried it, but it can be done. What I would do is add the milk, sugar, vanilla, pumpkin and spices in a sauce pan over low heat; stir constantly until just heated, you don’t want to burn the milk. Add the mixture to a hot cup of coffee and enjoy!! I will try this, this coming weekend to make sure it works out ok. I definitely tried it this morning and it wasn’t sweet enough. I had to dump it out cause I got More of a coffee taste than pumpkin :(. I have tried making pumpkin lattes with the plain pumpkin and you can always taste the pumpkin. I did make one with pumpkin pie filling and it was much better. The filling has all the flavors infused in the pumpkin and it doesn’t taste like plain pumpkin. This does look like a fun recipe! I have a Vita Mix and make my own almond milk so that will be my sub. There are ALWAYS coffee ice cubes in my freezer…nobody is allowed to waste leftover coffee in this house. Normally they just go into my morning protein shake but now I have to give your recipe a spin. Yum! Thank you!! The only place I could find coconut milk was in a $4, 8 oz. can in the mixers area in the alcohol aisle at the grocery. It’s getting more popular, so may be able to find it in the baking aisle with the almond milk. I may try the almond milk as someone said it worked fine, too. Sorry, left this comment on the wrong post…it goes with the next one! Oh my I can’t wait to try it!!!!! I just tried coconut milk at my local dutch bros. and I have no idea where to find coconut milk? I found your site through pinterest and I can’t wait to see all your other recipes!! Also, thank you for not waiting till its offically fall to introduce this wonderful drink!!!!!!! how you you make the frozen coffee? I take 1 1/2 cups water and add a heaping teaspoon of instant coffee, mix together and pour into a shallow piece of Tupperware that is freezer safe and cover it with a lid. Or you can use 1 1/2 cups of brewed coffee, let it cool to room temperature and place in a shallow piece of Tupperware, cover and place in the freezer. I hope this helps! Can’t seem to find any plain canned pumpkin anywhere in the store! 🙁 Would using pumpkin pie filling work as well? I heard pumpkin pie filling works wonderful!! Try it, just don’t add the pumpkin spice right now. Taste it first and add more spice if you’d like. Let me know how it tastes! I tried it and it worked fine! I did end up having to add the pumpkin spice as well because i didn’t taste much. It was really good! I added a little more pumpkin than the recipe stated (i really love the taste of pumpkin :P) and added more ice 🙂 Thanks for the recipe, very yummy!! Glad it turned out for you!! I made one today and I added a little more pumpkin myself!! I can’t have to much pumpkin!!! I made these tonight Thought I could be clever and substitute the stevia for sweetened coconut milk…BAD idea!! lol They turned out very bitter, not sweet at all. However, I did some quick thinking and added some lite maple syrup, and the day was saved! Delish! I probably upped the calorie content…but oh well. They were still healthier than the Starbucks ones! Great save with maple syrup!!! Some readers commented that they used maple syrup too! I’m going to try that next time. I bet the flavor was amazing!! I’m glad you found me!! Pumpkin Spice coffee would be wonderful!! It’s one of my favorites! I tried the cream one and it was good but really liquidy. Do you freeze the coconut milk first too? I ended up adding more ice to make it more of a frappe which made it a little watery and still kinda liquidy. Any suggestions? Thanks! I freeze my coconut milk. To defrost it I give it a quick zap in the microwave for about 45 seconds to soften it up a little. If it’s till to hard I’ll microwave it for another 20 seconds. Then I add it into my blender and process until it’s smooth. Hope this helps. Just tried this last night, it was delish! Thanks for posting. Sounds and looks delish. I must know….where did you get those adorable straws??? Thank you! I got the straws at Cost Plus World Market. Does the calorie count mean for 16ish oz’s? I’m diabetic so I have to watch carbs and sugars and cal! Hi juat wondering if the second Starbucks is a non coffee version as well? I don’t have coconut milk readily available, so I think I might try almond milk… do you think that’s a good or bad idea? Welp, I’ll give it a try and let you know how it comes out! Confirmed- almond milk works as coconut milk sub! So delicious! Thanks again!! So glad you like it!! I’ll have to try it with almond milk!! This looked so delicious that I had to run up to the store and get the ingredients. I just made the non-coffee one, tastes great, but it is a little grainy. Is that normal? I’m so excited, I love pumpkin flavored anything and especially these treats from Starbucks. So I am super happy you’ve put a recipe up to make them and I can probably make them year-round now! I found your blog through pinterest! Also, I did have one suggestion for the coffee one, if you freeze the coffee in ice cube trays then you probably wouldn’t have to partially thaw them 🙂 Just an idea, because I make smoothies a lot and the ice cubes break down well so the coffee in that form, should too 🙂 Thanks again for the fabulous recipes! Great idea Lindsey! I should put my coffee in ice cube trays, it would make it so much easier! I’m going to try that!!! Thank you!! 🙂 Enjoy the drink!! It sounds so good but I just made this and the non coffe one tastes not good, for lack of a better way to put it. Tastes raw in a way, coconut milk just isn’t the vast for this recipe. For the record i used silk’s coconut milk and Libby’s can pumpkin, not the pie. Sad. I’m sorry it didn’t turn out for you! 🙁 Thank you for letting me know. I appreciate the criticism! Made the one with coffee! Smelled delish! Couldn’t put my finger on what it was that threw mine off but it might just be that my blender doesn’t crush ice so well. Thanks for sharing! I grew tons of little Sugar Pie pumpkins this year. I am going to cook and sieve some of them and freeze them in 2 Tbs “pancakes” so I have pumpkin ready at all times! I haven’t even tried them yet and I am still positive I am going to love them! I am diabetic and really have to watch the cals and carbs, but love TREATS! This will be wonderful! Thank you so much! Just wanted you to know I just made this with hot coffee. Absolutely amazing…better than bucks. Thank you thank you. Yah!!!!!!!!!!!!!! I am so glad you liked it!!! I am going to make the hot version tomorrow for breakfast. I haven’t done it yet, but I can’t wait to try it! Sorry so long to reply. I used the carton unsweetened coconut milk, either in the refrigerated section or I use the carton kind in the aisle. I don’t use the canned coconut. Hope you enjoy your drink!!! I made this tonight and absolutely loved it! I am so glad I found your site! I love frappes and smoothies so I read all of the other recipes you had as well. I read all of the above comments before posting, but I do have a tip. I put my coffee in ice cube trays AND my pumpkin in ice cube trays. Then I just put the cubes in ziploc bags. I looked on one of your other recipes and you suggested using Xanthan Gum so that it wouldn’t separate. I found it at Wal-Mart in the Gluten-free section and it was only $0.48 a package (which I think will make about 6 shakes). I followed the recipe exactly (plus the Xanthan Gum) and LOVED it!!!!! Wow, you found Xanthan Gum for .48 a package? I paid $12.99 for mine at my local grocery store! I’m going to Walmart tomorrow to see if I can find it! I love the idea of putting coffee in ice cube trays!! I need to really do that, instead of making on batch at a time!! I never thought of putting pumpkin in ice cube trays, I love that!! !So glad you loved the drink!! 🙂 Thank you again for the suggestions!!! I’m really excited to go Walmart! I’m so curious if you tried the hot version? Sounds so delicious, but I prefer hot drinks!!! I will definitely be following your blog! Hi Brittany, not yet! It’s been in the 90’s here and all I can think of is Frappes, but I promise the recipe will be coming soon!! I’m a pumpkin freak and a coffee freak – I have to try these! I never drink Starbucks, but I hear about their pumpkin drinks all the time. Thanks for sharing. I love your recipe! I am going to try it with soy milk. Hopefully it tastes as delicious as yours looks! This looks so delicious, and I will definitely have to try it ASAP. I posted your picture (with photo credit) and your recipe’s link to my blog today and I hope you are fine with that! THIS IS SO DELISH i used dunkin donuts pumpkin spice coffee in mine in OH MY even more pumpkin flavor now i dont have to drive 30 minutes to the closest starbucks and get my fix..haha ..!! thanks have you done a hot pumkin drink yet? I have pumpkin coffee…did you brew it first? yes i did then i froze it it was sooo good! Oh good, so glad it worked out and you liked it!! Sounds amazing! Can’t wait to try it out! Could I use agave nectar instead of stevia? I really like that as my go to sweetener. Also you mentioned that the frappe was vegan? That is without the whipped cream right? Or are you using a vegan whipped cream for the recipe? i tried this with agave this weekend. it was splendid! my only note was that i had to brew my coffee darker than usual to compensate for freezing it into cubes. thanks for the great recipe! Your welcome! I love the idea of using agave instead of stevia or sugar! I bet it was good that way! Yah! ! So glad you like it!!! Do you think this recipe would work using pumpkin butter instead of canned pumpkin? I’m 99% positive it would be just fine (perhaps even better since the butter has spices already in it and is already a smooth creamy texture) and I just happen to already have pumpkin butter on hand. Should I keep the measurements the same though? Let me know! I’m gonna make it this weekend for sure! Hi Alex! I am not sure how it would taste! I would say go for it and taste test it to see if you need to add the pumpkin spice. It will probably work out fine! Keep the measurements the same and taste it to see if you need to add more pumpkin butter. Let me know if it works out!! I tried the non coffee version of this drink today and it is divine!!!!!! Thanks for posting this recipe!! I made this today and It was gross! Only thing I changed was unsweetened almond milk instead of coconut milk. . I am going to try again with honey or sugar. May be it was Stevia Idk. By the way I love love your blog and journey to lose weight. Thank you! Please try again! I actually just found that different stevia brands taste different and add a different sweetness level and flavor! I just made this with hot coffee and it came out great. Yummy! I know for fact that my friend and I will so be trying this as we are both huge pumpkin pie fans, i will let you know how it goes! I am wondering if you might could figure out a way to make smaller batches of this. I had gastric sleeve not too long ago and I know there is no way I could drink 2 cups in a day and it not melt. As I’m not sure how it would keep in the freezer till I’m ready for more. I would cut the recipe in half or freeze it! When your ready for it, just take out of the freezer and place on the counter till it softens a bit then pop back in the blender to blend it up again!! So yummy! Made these for my family tonight and were perfect for a fall evening dessert! I used raw agave nectar instead of the stevia. It adds about 30 calories per serving but there is absolutely no after taste like that of stevia! Can’t wait to make these again…thanks for sharing! Love your site! I’m so glad you like it! It’s one of my favorite drinks!! Very yummy! I followed the recipe for the coffee version minus the whipped topping and I used regular sugar instead of stevia and came up with 114 calories? When I ran the numbers with stevia it was 98 calories. How did you come up with your counts? Oh my I can not wait to try it! I am going to the store tomorrow! I made 1/2 cup of strong instant espresso and used 1 cup ice cubes with it. Instead of coconut milk and vanilla extract, I also used vanilla soy milk and added 1 packet of sweet and low. It turned out wonderful, thank you! Super excited to try this! However, I’m looking at this recipe going, “A TEASPOON of stevia???????? ?” I would think that much stevia would make it overly, sickeningly sweet, no? Hi Bethany! Try 1/2 teaspoon (one packet) first! For some reason I have had a major sweet tooth lately. Then adjust the sugar to your liking. First I want to saw awesome can’t wait to make it. But, I have a question on the frozen coffee. Do you sweeten the coffee before you freeze it or the rest of the ingredients are enough to sweeten the drink? I just made this and it’s redonkulous! so so so good! I cannot drink coffee (stomach issues) so I made just the pumpkin cream version. I used ‘So Delicious’ brand coconut milk, in the original variety. It was 1.49 for a 32 oz. carton. I ended up using a whole cupful of crushed ice to get it thicker. My son is going to love this since it’s coffee-free, he can actually have some! Thanks again!! I’m so glad you like it and I love that you used So Delicious! I bet it tastes great! Can I use almond milk instead of coconut milk? I’ve never been a fan of anything coconut. Plus I already have almond milk at my house. Would love to try you recipe ASAP looks absolutely delish! I love the sound if this! I think I’ll sub the coconut milk for low fat milk(1%) with a few drops of coconut extract. Thanks for posting! Ohhh, that sounds good!!! I don’t think you need the coconut extract, it’s not a real strong coconut taste. That looks fab! I love coconut milk, I can’t wait to try this! Thank you! If you try it let me know what you think of it. I can see why this is a favorite of 2012. YUMMY! Can you use ice and liquid coffee????? What do you mean by coffee thawed/frozen. How did you prepare that? I’m so excited to try this but really really don’t like coconut. can i use anything in place of the coconut milk? like would soy milk or regular milk work? also the frozen coffee is with milk? or just coffee and water? Thanks 🙂 can’t wait to try!! 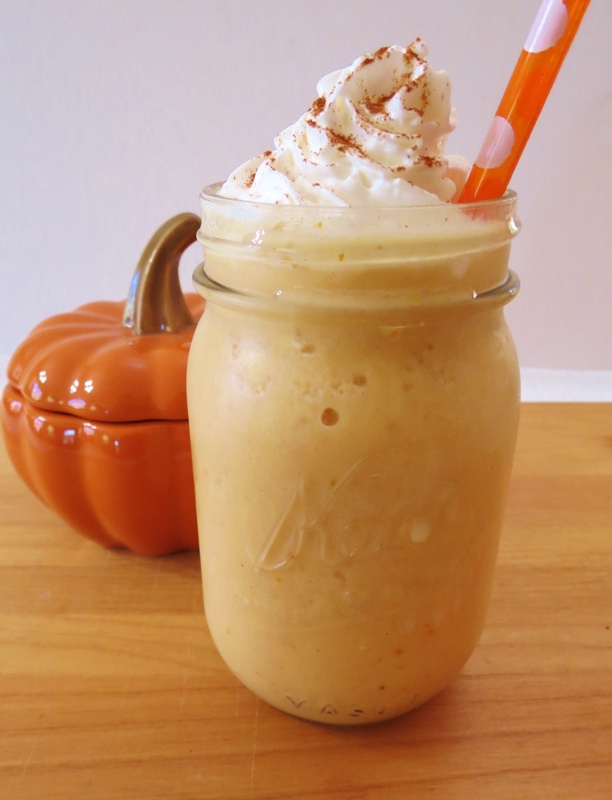 I’m having company coming tomorrow and I’ll be making this Pumpkin Spice Frappe for dessert! It sounds awesome! I saw a picture of it pinned on Pinterest and I just had to find out what it was because it looked SOOO yummy! Thanks for sharing… especially for going the extra mile too for us non-coffee drinkers. Can’t wait to try it tomorrow. I’ll have to let you know what everyone thought. Thanks Robin and thanks for the e-mail! I’m taking a class next week to help! Just made the coffee version and OH MY it’s AWESOME! This is something I would pay $5 for at Starbucks. I’m glad I found a version that I can make at home for a fraction of the price. THANK YOU!! I saw this recipe pinned on pinterest and remembered that I had a can of organic pumpkin pie mix in the pantry, so to the kitchen immediately I went and whipped up the non-coffee version. I was out of coconut milk so I just used regular organic whole milk and cut the sweetener and pumpkin pie spice in half since the mix was already sweetened and spiced. It came out great. It tastes just like pumpkin pie and two out of three of the household really liked it. Thanks for sharing. I hope the second one turns out for you! Thank you for letting me know. Thanks Pau! That coconut can get confusing!!! 🙂 Thanks for letting people know. How about using Almond Milk??? I think almond milk will work. I haven’t used it, but it’s just as creamy as coconut milk. You just might get a hint of almond tastes, but that would go nicely with pumpkin! Thank you Roseann! I think I need to make one right now!! I am in the pumpkin mood! Ohhhh I am so glad you liked it and thank you so much for telling me!!! hi, I was so excited I went out and bought everything to make this! I woke up ready to make it all to find out i guess I should have pre made the coffee and froze it last night?? Is that how you do it? and how much time do you thaw it? Just need some more info on the coffee part. adding ice to the coffee this morning didn’t work too well! thanks, looks yummy! I freeze 1 1/2 cups of coffee in the freezer over night or for at least 4 – 6 hours. Let it thaw on the counter or give it a quick zap in the microwave to help it melt a little. Then I break it apart with an ice pick and throw the chunks in my blender. Hope this helps. Or add a ton of ice with really cold coffee in the blender. I do this in a pinch! There’s no way a Starbucks frappuccino has 0 grams of fat because we make them with whole Milk and I know that because I work there. My Starbucks version is made with non-fat milk, and according to the Starbucks website, it has 0 fat using non-fat milk and no whip cream. But come sin at 260 calories for a grande. Actually I just re-checked and the nutritional stats is 0 fat in an latte. They don’t have the frappuccino on the website. So I googled it and it’s still 0 fat if using non-fat milk. 🙂 You must love working at SB! I am in there almost everyday!! Oh if you get it made with nonfat then yes, but make sure you ask for it with nonfat or the frappuccino light because the standard for a normal frappucino is whole Mille which is definitely lots of fat! If you want it to blend better and creamier use an 1/8 of a tsp of xantham gum mixed with a table spoon of water and it will help it blend. I love xantham gum, it works great and a little bit goes a long way!!! Thanks for the scoop! I added a heaping spoon of protein powder since there wasn’t a lot in there. I try not to drink emtpy foods so adding that gave me the excuse to try it … lol. It was great! The vanilla protein powder actually gave it another flavor layer and worked well with the pumpkin. Yum! What a great idea! I so love that!! I think I will try that next time when I make my frappe. I just need more pumpkin, I am out of it! Hi I just got the ingredients to try this but am now a bit worried after reading some comments. I got canned unsweetened coconut milk. Is there any way to make this work? Also, where can you find coconut milk in a carton? Hi Anna, Don’t use the canned coconut milk. I would use regular milk or non-fat milk instead. It may not turn out as creamy, but it will still taste good. But using canned coconut milk with make it greasy and not very good at all. Save the canned coconut milk for other things like mixing in soup or mashed potatoes or using in baking. I buy my coconut milk in a carton at Trader Joe’s or I have also used brands like So Delicious. It’s normally located in a regular grocery store in the cereal isle with the soy milk and almond milk. You may even find it in the refrigerator isle with milk. Okay great, I’ll just use milk for now until I can get my hands on some carton coconut milk. Where did you find the frozen coffee? Or is this something you made yourself? If so are there any pointers you have? Certain coffee? Certain strength? Thanks in advance!! I can’t wait to make this!!! I just made some coffee and popped it in a freezer safe bowl, covered and froze for at least 4 hours. If it’s to solid, just microwave it for a few seconds until it starts to thaw a little bit and then break the rest up an drop in the blender. If you want it now, I recommend brewing some coffee, and placing in the freezer or fridge until it’s cold. the add it to the blender and add a cup or two of ice. I just tried the recipe out and while it tasted great, it turned out a little too thin for me. When I think of a frappé, I think of a thick texture like a smoothie, but mine was really watery. Any thoughts on where I went wrong? Not enough ice, maybe? Maybe next time I’ll treat myself to a little scoop of vanilla frozen yogurt in there… not super great for the calorie count, but I feel like it would evoke the texture that I like best. Either way, I did really like the taste of it! Hmmm, mine is normally super thick. I’d say add more ice. Did you freeze your coffee or the coconut milk? A scoop of vanilla frozen yogurt would take this frappe up to another level. I bet it would taste great!!! Hey Hun great recipes .. For those who want to pump up the protein just add one pkg unflavored gelatin to the recipe.. Does not change the flavor however adds 8 grams of protein!! Wow, that’s a great idea! I love it! Thank you for sharing! I made the cream version with silk soy milk and 1 tb sugar. Turned out just fine! 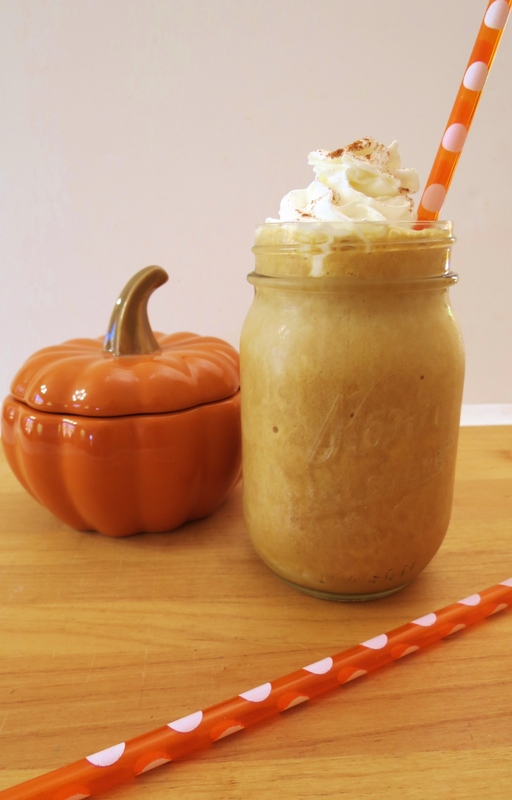 I just made the Pumpkin and Cream Frappe, followed the recipe, step by step, it was horrible. Sorry Jeri that this recipe did not turn out for you. Wow! This tastes really good! Just shared this with LinkedIn and I hope to be able to share this on tumblr if you don’t mind. I am so glad you liked it! I need to make one soon. I haven’t stocked up on pumpkin yet. Thank you so much for sharing! Ugh I happened to buy coconut milk in the can a couple days ago, not having any experience w coc. Milk..and now so disappointed I can’t have this tomorrow am! Thank god I read the recipe and found out about the milk before making it rho! Thanks everyone! Hi Lorra, I made that mistake too, when I was looking for coconut milk. If you have another kind of milk, that will work too. I personally love coconut milk, but I have used non-fat milk in this recipe too. Enjoy! The recipe is so good I can’t wait to try it. I have been on a keto diet for the last six months and feel that this will be my best cheat meal. Thank you for sharing.